We try at every wedding to get at least one Silhouette image assuming the light is right. There is something particularly dramatic about only seeing the outline of the couple. It definitely adds something different to a wedding portfolio of images. In this images, we placed a remotely controlled Flash unit which was controlled by a radio slave behind the couple and aimed at the bottom of the dress. Since the wedding dress is white, it acts as a reflector and lights up the background. It also caused a little bit of a glow behind the bride and groom. This is the best way to get the effect we wanted and doesn't take very long at all. Once the lighting is established, its just a matter of posing the married couple in the best possible way to make a nice silhouette. 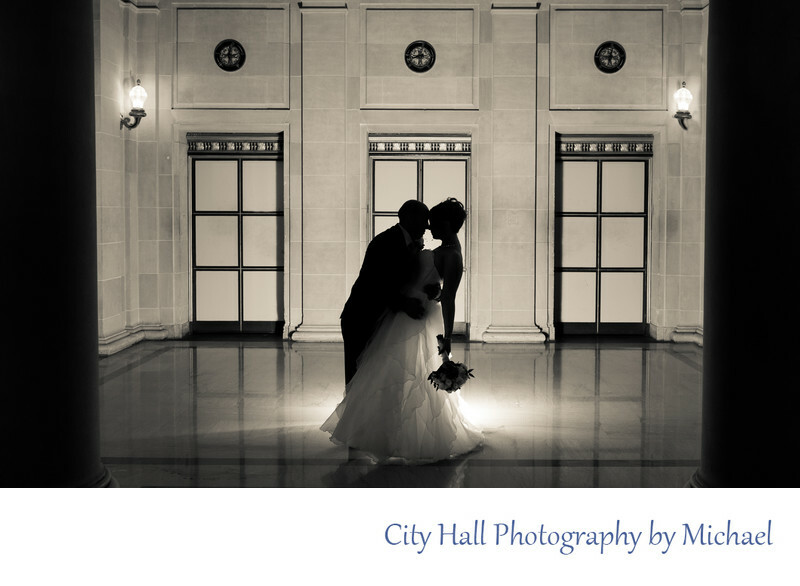 We try with different backgrounds at city hall and try to make each image unique and special for the bride and groom.